South Austin is a big area, and this is not an attempt to cover every place. But I will break it down for you two ways: by geography and by genre. The places listed are personal favorites that I have enjoyed over the years. I am linking to their websites, but if you search my blog, I have posted about almost all of them at one point or another! If you're looking for food trailers in south Austin, check out my other city guide post! 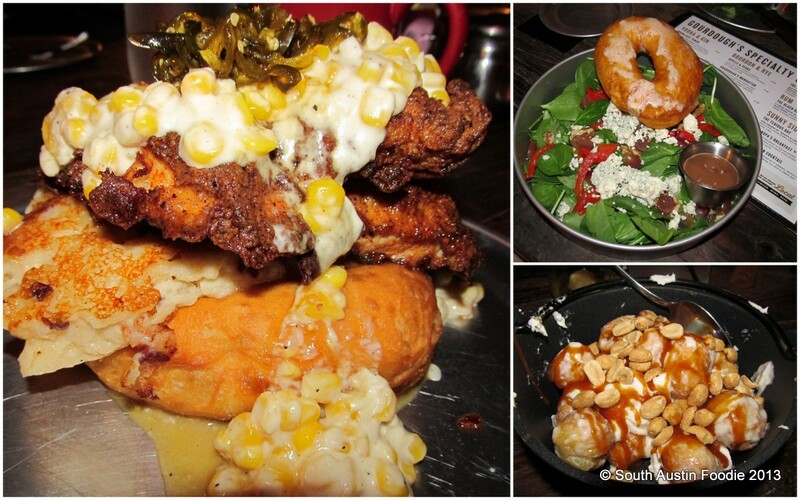 And for the rest of the Austin Food Bloggers Alliance 2013 City Guide, check here! -- Doc's -- Bar with decent food, and fabulous people watching if you're sitting on the patio. -- Snack Bar -- An eclectic menu but somehow it works! The Brussels sprouts were yummy! -- Perla's -- Raw oyster bar and seafood; my last trip wasn't as stellar, but I think it was an anomaly. -- Homeslice Pizza -- "The" pizza spot on SoCo, generally long waits in the main restaurant; call ahead and get it to go! -- Enoteca/Vespaio -- Enoteca is the bistro side, Vespaio more the fine dining, but they share the same kitchen. If I could eat Enoteca's carbonara everyday, I would! And dang it, for as many times as I have eaten it, I can't find a picture. Must remedy. -- Magnolia Cafe -- Open 24/7, lots of vegetarian options; love the Bernadette Salad with spicy garlic cream dressing. -- Lucy's Fried Chicken -- It's darn fine fried chicken. -- Havana -- Cuban, I've loved this place for years, though the service can be spotty. Nothing like a mojito and maduros under one of their cabanas; pollo salteado and ropa vieja are entree faves. -- El Borrego de Oro (no website, 3900 S. Congress @ Dunlap, just before Ben White/290) This interior Mexican spot is easy to overlook, but the food is well-prepared, from moles to lamb stew. -- Curra's -- On Oltorf, between Congress and I-35, good for B/L/D, nice mole, avocado margaritas, more interior than Tex-Mex. -- Sway -- Just opened in December, it's Thai with Australian influences. A bit noisy inside, but luscious food -- jungle curry and oysters with nahm jim sauce were standouts; they do a nice job not just with flavors, but textures as well. In picture below are the prawn miange and jungle curry. 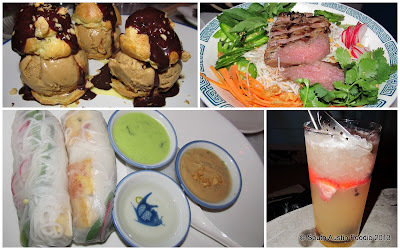 -- Elizabeth Street Cafe -- French-inspired Vietnamese food with modern twists; the green sauce with the spring and egg rolls is divine, and don't forget dessert! -- Freddy's Place -- When the weather's good, their outdoor space is awesome; burgers and beers. 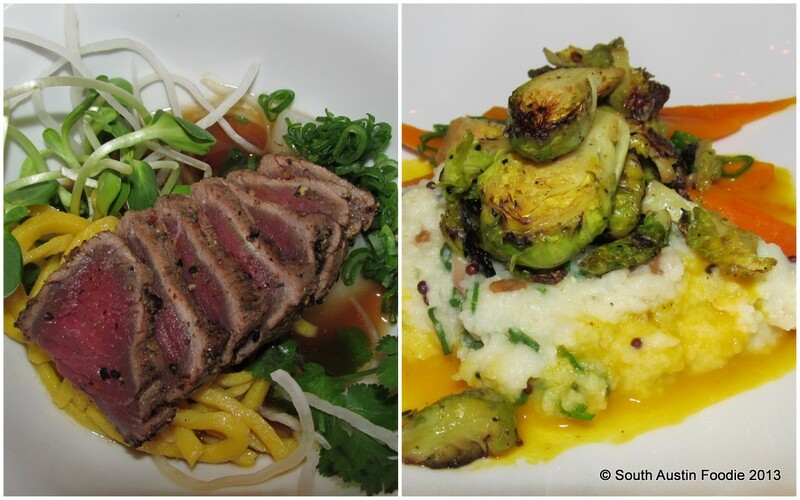 -- Lenoir -- A wonderful addition to the neighborhood this past year; upscale, intimate, innovative food, and prix fixe. Constantly changing seasonal menu; they've also recently expanded their back patio area. -- Soup Peddler/Juicebox -- A walk-up window for smoothies, fresh juice, salads and sandwiches. -- La Mexicana -- Cheap and good breakfast tacos, open 24 hours a day, and it's a full-on Mexican panaderia. -- Bouldin Creek Cafe -- All vegetarian, love their veggie burger! And for breakfast, the Smokin' Joe omelet. -- Habanero -- Just east of South 1st, small spot, big tastes! Limited hours. -- Paggi House -- Sort of a hidden gem, great happy hours in a finer dining setting. -- Uchi -- Modern Japanese, and not just sushi. Maybe you've heard of them? -- Sazon -- Good interior Mexican, huitlacoche empanadas and one of the better mole sauces in South Austin; service has been a little spotty at times. -- Barley Swine -- Small plates, but extremely interesting ones with not your ordinary ingredients. Sweet breads. Trotters. Beer ice cream. Also a changing, seasonal menu. -- Henri's Wine and Cheese -- Nice wine and cheese bar that does light meals as well. -- Olivia --A beautifully designed space by local award-winning architect Michael Hsu; open for dinners and weekend brunch. Contemporary American food. -- Black Sheep Lodge -- Pub grub at some of it's finest; Nathan's corn dog bites and fried pickle chips? Yes, please. -- Mr. Natural -- I haven't been in ages, but it's very hardy vegetarian food. -- Papalote -- Mexican street food; tiny place with limited seating, I think they do a lot of to-go orders. REALLY good, and some vegetarian options. -- Kerbey Lane -- The other 24 hour hot spot with lots of vegetarian items. -- Red's Porch -- More than just bar food, they do Southern/Mexican/Cajun inspired plates. -- Bombay Bistro -- Indian restaurant, with a solid lunch buffet; from the regular menu, the broth for the curry mussels was amazing. -- Dong Nai (no website, 4101 S. Lamar, in the same strip center as Target)-- Vietnamese, with excellent pho and bun bowls. -- Sandy's (no website, 603 Barton Springs Road)-- The iconic fast food/drive thru, but where else can you get frozen custard like this? -- El Alma -- Interior Mexican, nice upstairs outdoor patio, duck enmoladas (duck enchiladas with mole sauce) had some kick. This picture was one of the gordita + chorizo appetizer specials. -- Casa de Luz -- It's macrobiotic, which is incredibly healthy for you, but sometimes lacks a punch. The sauces and gravies seem to be the stars of the show, at least for this recent meal -- mushroom gravy on the rice and almond-basil sauce on the greens were filled with umami flavors! -- Central Market Cafe -- B/L/D and you can get your groceries! -- Tarka -- Modern Indian in Sunset Valley, the "naaninis" are a twist on panini sandwiches. Good for take out too. -- IM Thai -- Apparently the kitchen has changed over a few times, but I was quite happy on a recent visit -- rice balls from the appetizer menu, tom kha soup, and fried catfish with coconut red curry sauce were the standouts. -- Hill's Cafe -- Your spot for "Texas" food -- one of my favorite burgers in town, served on a kolache bun, chicken fried steak, live music. -- Evangeline Cafe -- One of Austin's best Cajun spots, hands down. Po boys, little crispy fried onion rings, and the dessert pistolette -- yummy! -- Galaxy Cafe -- Soup, salads, sandwiches. -- Cafe Malta -- A broad-reaching Mediterranean menu; I want to love everything they do, but it's been a bit hit or miss for me, though I know others who have had great experiences there. -- Pho Thaison -- Small local chain with a few outlets, their pork dishes were particularly good, both the vermicelli bowl and banh mi, below. -- Yanagi -- Traditional Japanese, good value bento boxes for lunch. -- *We're lacking good Chinese food with the closure of Suzi's; I've heard China Dynasty on Slaughter is good, but haven't been. Sweets -- ok, all are shops, rather than restaurants (but each place has a little bit of seating), but trust me, you WON'T be disappointed! -- La Patisserie -- Fine French pastries; the suggestion for the toasted almond macaroon was mine! -- Sugar Mama's Bakeshop -- Cupcakes and baked goods galore! Also has vegan options. What are your favorite South Austin restaurants (and which dishes) that I should be considering? Pretty good wrap up of South Austin, but I do love me some Polvo's for breakfast and Azul Tequila (same owners as Papalote I think)! Glad to see my favorite Vietnamese spot on here-Dong Nai! Another surprisingly good Mexican spot(s) is Tres Amigos, same owners as Green Pastures probably explains why. Thanks Frank! Great suggestions too. Yes, Papalote and Azul Tequila are owned by the same people. I have liked AT in the past, but it's been a very long time since I've been there. I'll have to check Tres Amigos out, because I haven't been. I need to go to Evangeline again soon! La Posada does fine for nearby Mexican (Westgate and William Cannon) ...their Lengua tacos are still my favorite in town. Thank you! Come & visit! I guess this guide could help me plan my next year trip to austin! Stay tuned! My 2016 guide will be out around March 1st.